"Moosehead Lake, Maine, New Mount Kineo House, Motor Boat Races at the . 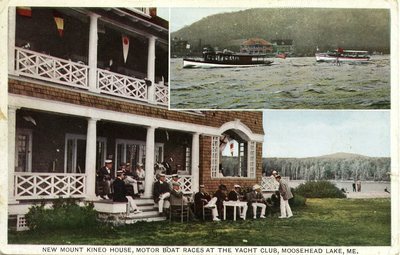 . ."
A postcard of a group of men sitting outside of the New Mount Kineo House Yacht Club, watching motor boat races on Moosehead Lake. The postmark on the back of the postcard is dated June, 1918.